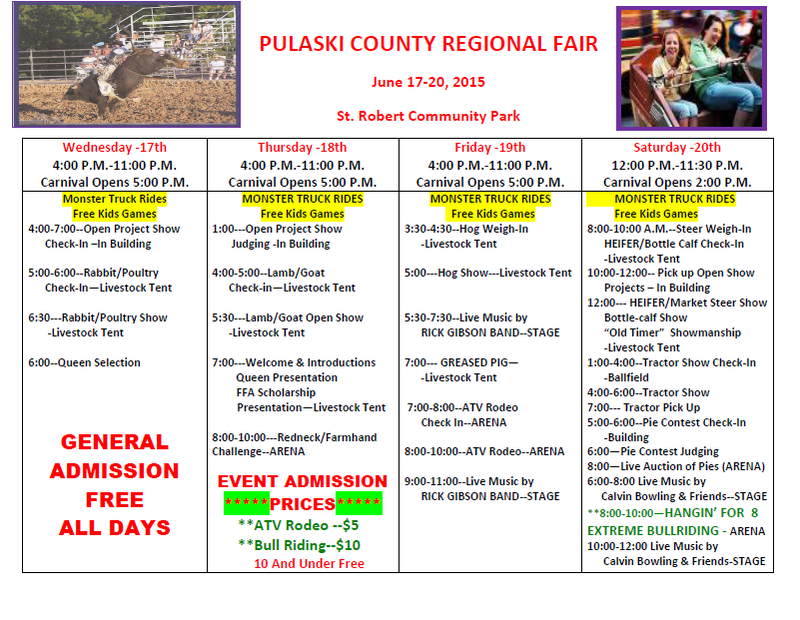 Pulaski County Regional Fair will be held in Saint Robert June 17th-20th! What: Official unveiling of 7 Trail of Tears exhibits. 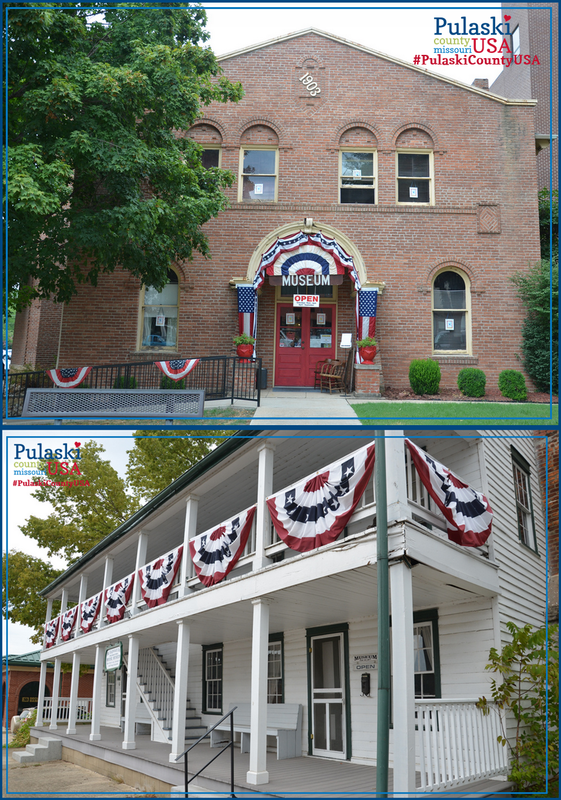 Sponsored by National Park Service in partnership with Trail of Tears Association, City of Waynesville, and Pulaski County Tourism Bureau. 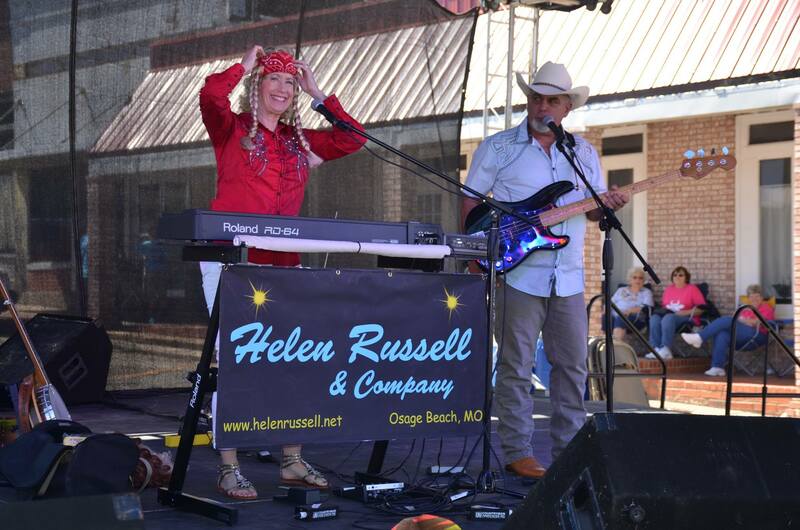 Honored guests include Remember The Removal Riders. 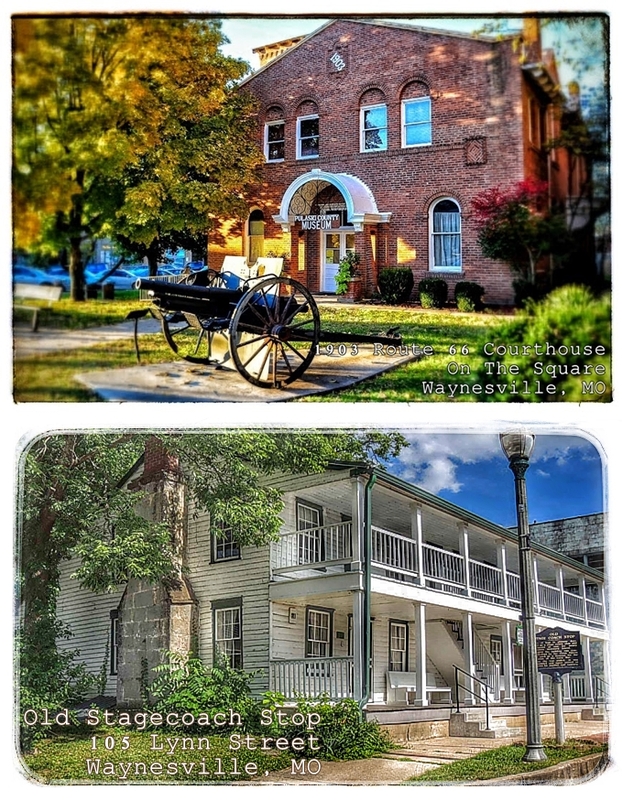 Unveiling of seven Trail of Tears Wayside exhibits takes place in Laughlin Park June 19th. 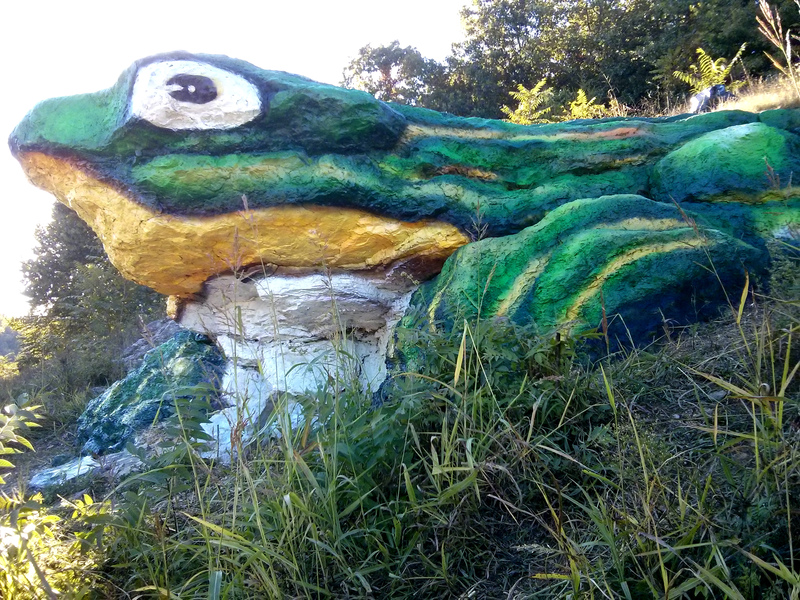 One of only seven certified sites in Missouri. 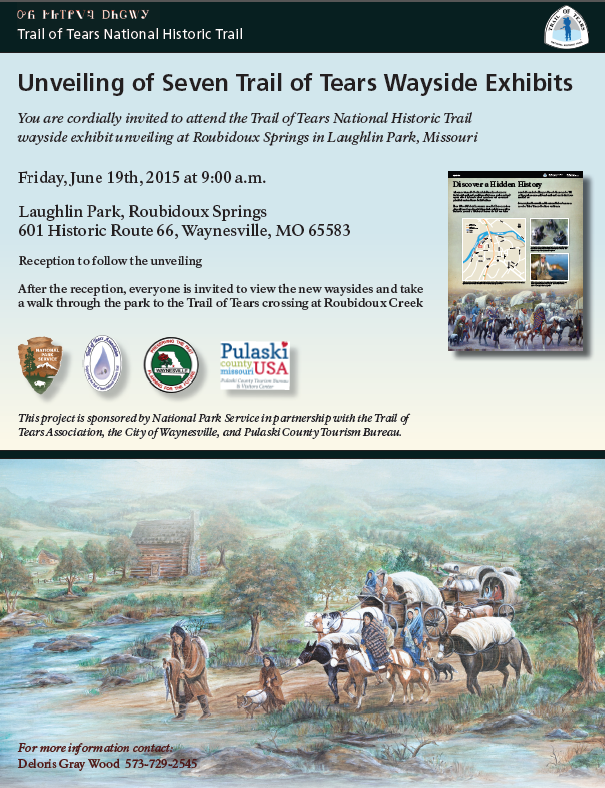 Sponsored by National Park Service in partnership with Trail of Tears Association, City of Waynesville, and Pulaski County Tourism Bureau. Honored guests include Remember The Removal Riders. Cost: $150 per adult team, $90 per youth team, $35 per individual. 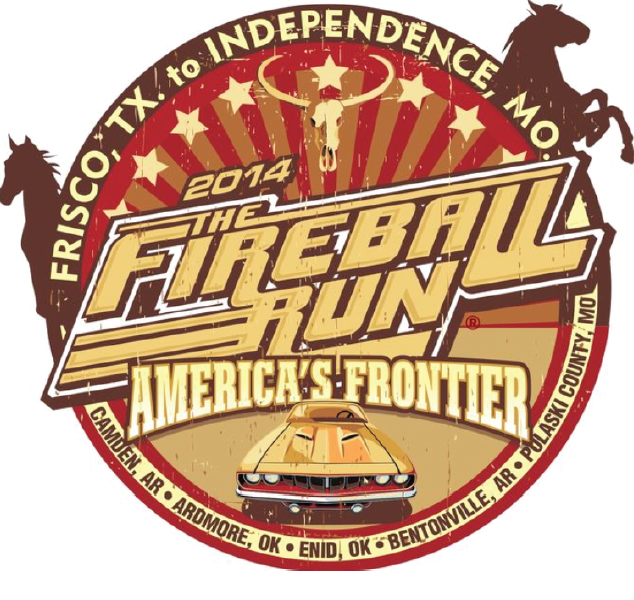 Pre race registration discounts. 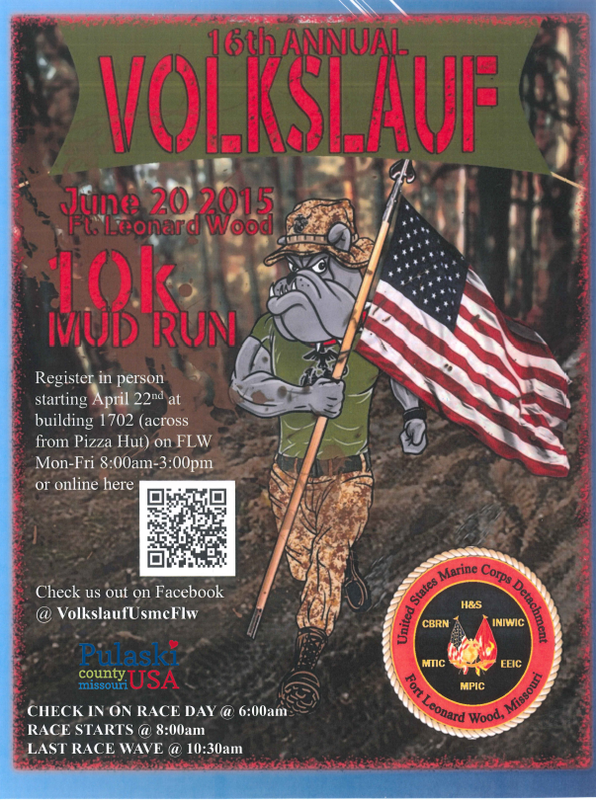 Hosted by the United States Marine Corps Detachment at Fort Leonard Wood the 16th Annual Volkslauf is a motivated 10K Mud Run. 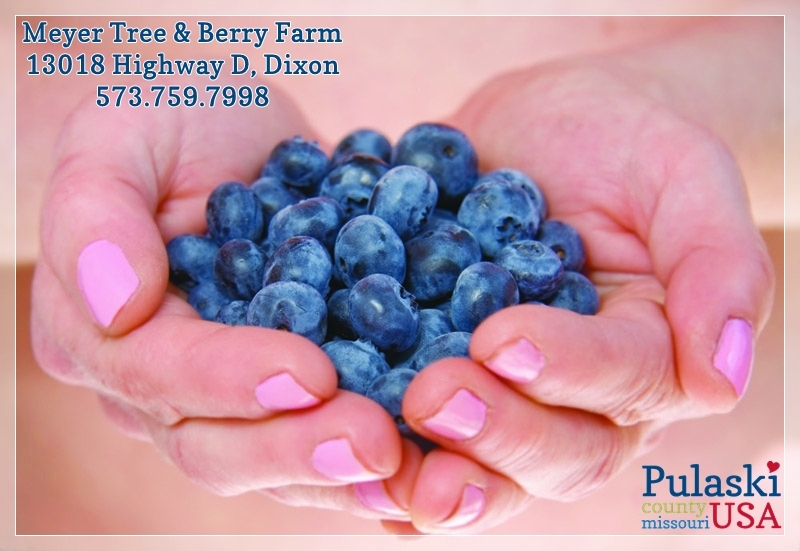 Create lasting memories with your family as you pick your own blueberries at Meyer Tree and Berry Farm near Dixon, MO! 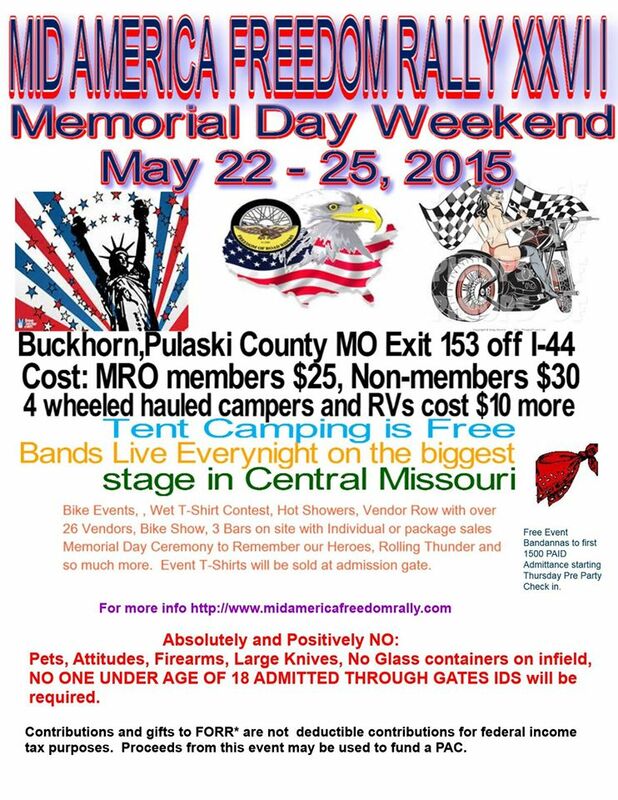 Where: Ride begins at Ozark Harley Davidson in Lebanon and ends at Route 66 Freedom Fest on the Square in Waynesville. When: Registration begin at 10 am, ride departs at Noon. 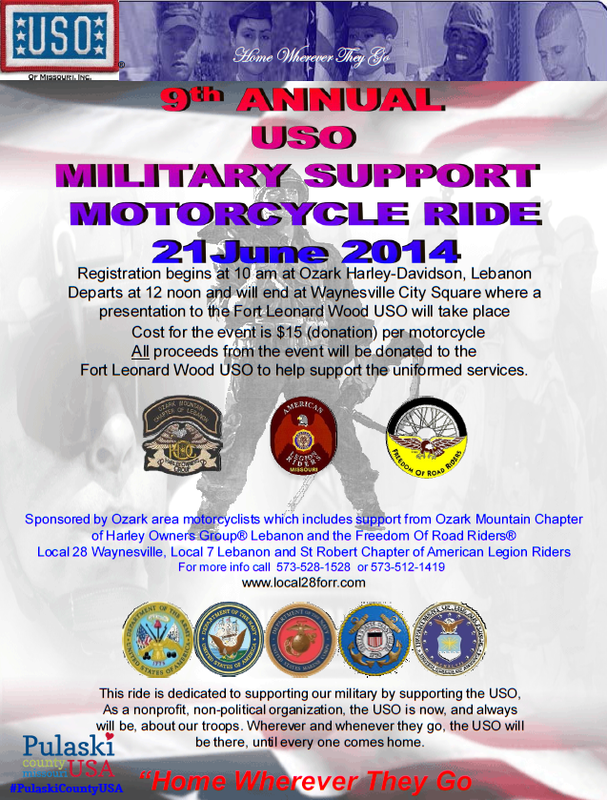 Show your patriotic pride and support the USO and our military during this annual motorcycle ride! 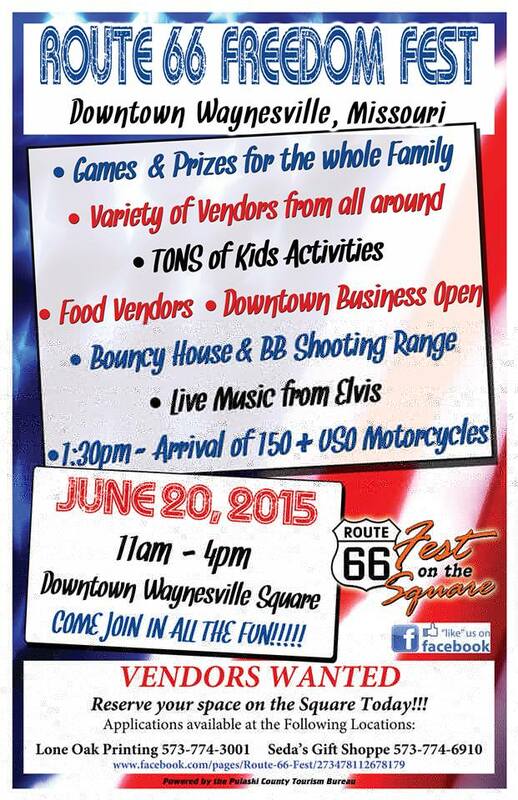 Bring your family to downtown Waynesville for this street festival! 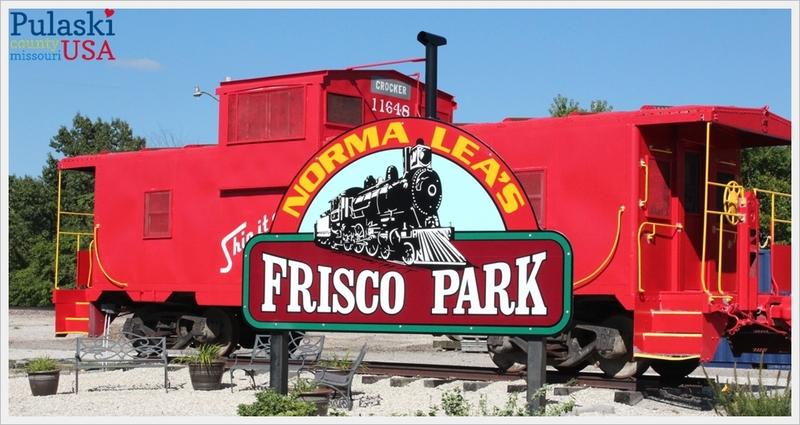 Vintage cars from The Great Race will be on hand and watch 200+ motorcycles roll into town for the conclusion of the USO Support Ride. 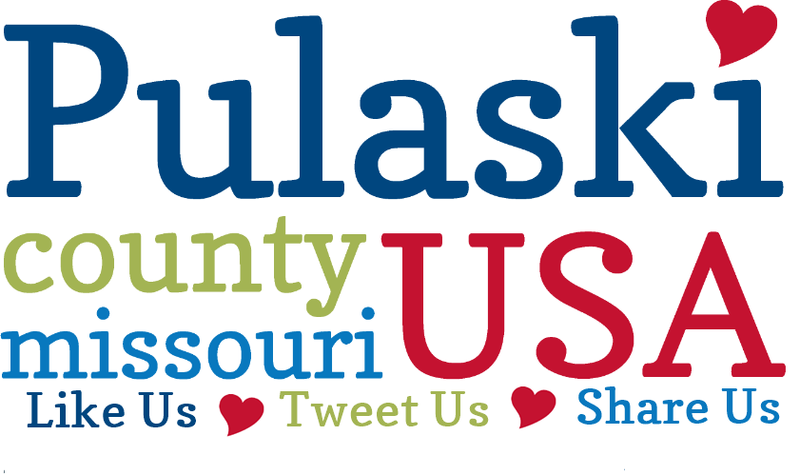 What: Pictorial tribute to Missourians who have lost their lives in the line of duty since 9/11. 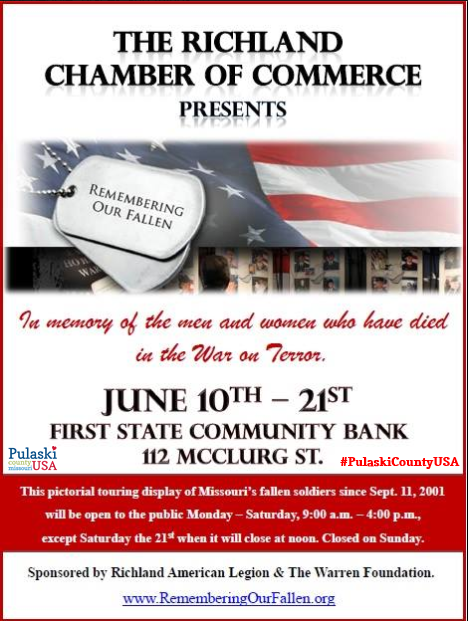 Remembering Our Fallen, a touring photo display, will be in Richland June 10th-21st. 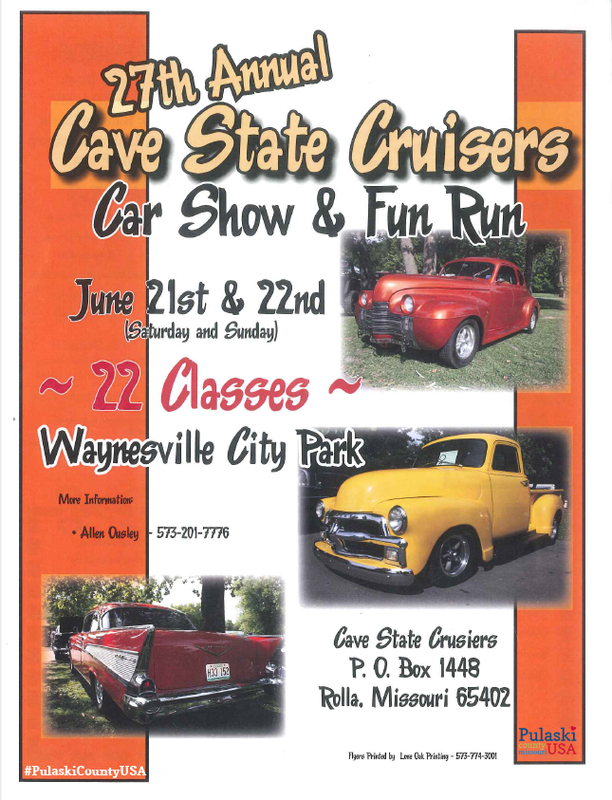 Cave States Cruisers return to Waynesville City Park June 21 & 22 for their annual Car Show & Fun Run. 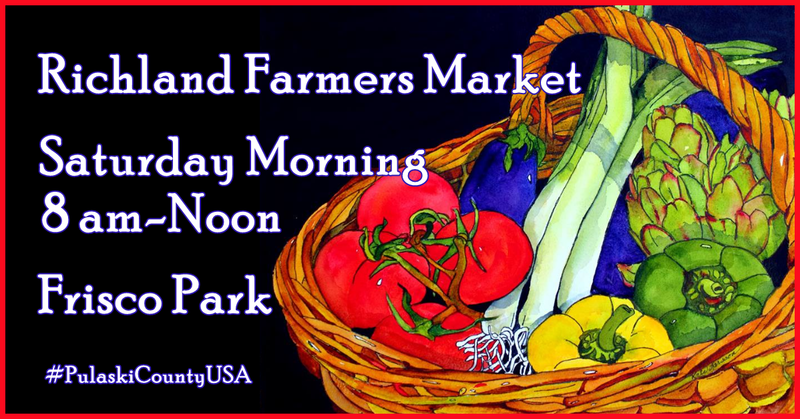 Richland Farmers Market is held Saturdays, 8 am until 12, in Frisco Park. 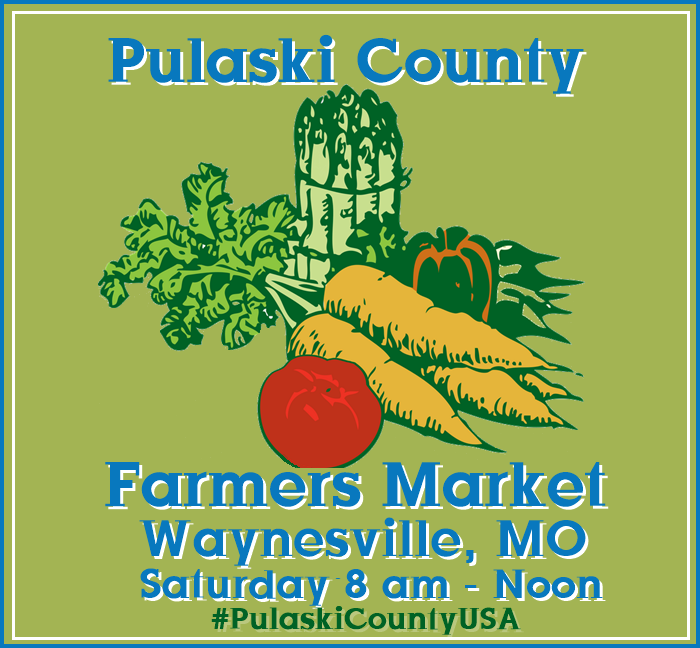 Pulaski County Farmers Market has extended their hours! Now open until 1 pm! 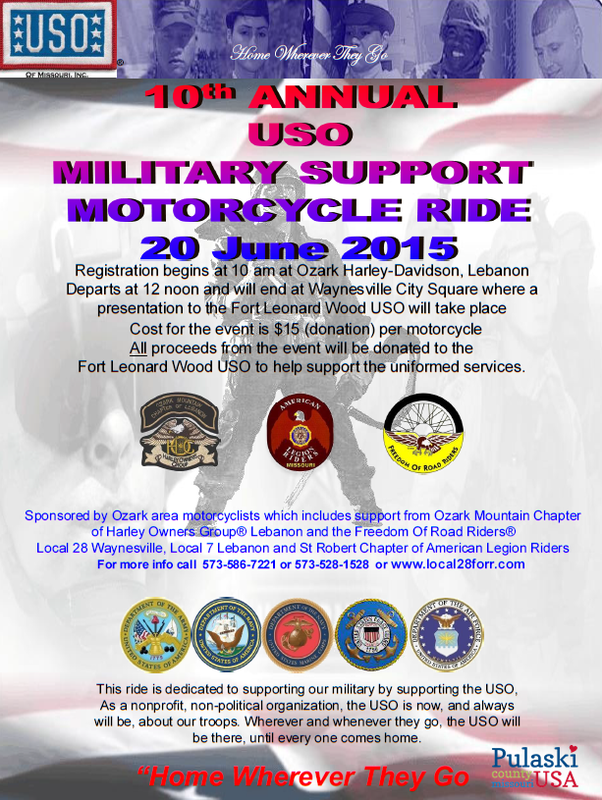 USO Military Support Motorcycle Ride rides Route 66 from Lebanon to Waynesville Square June 21st. 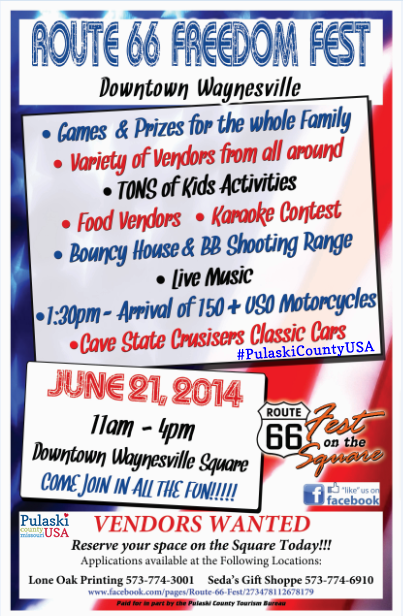 Don’t miss this family friendly street festival on Route 66 in Waynesville. Professional wrestling returns to Pulaski County June 21st.